Fast and central access to current information and less redundant communication! BlueSpice is the enterprise distribution of the famous Wikipedia software MediaWiki. And this software offers much more than just a sample of extensions. 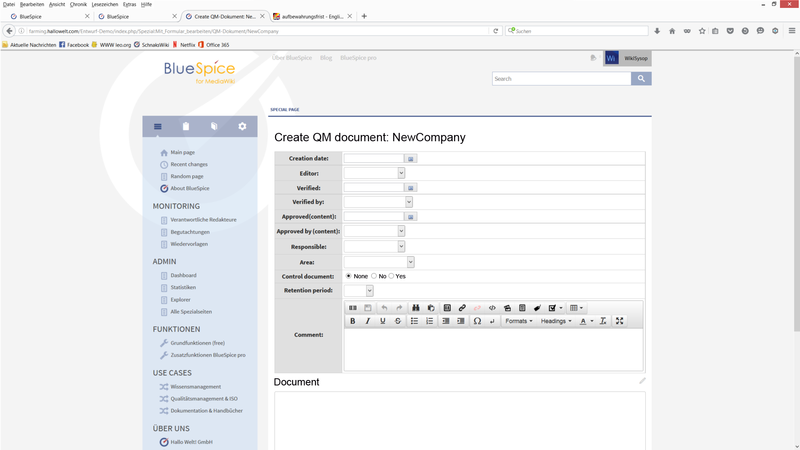 BlueSpice is the optimized tool for agile knowledge management, documentation and collaboration. Knowledge and quality management: Share business critical knowledge and develop quality standards for products and services (e.g. for the implementation of ISO 9001 or the General Data Protection Regulation). Technical and organizational manuals: Provide system descriptions, instruction manuals, process descriptions, quality and security handbooks and IT documentation online. Collaboration: Collect ideas and experiences, share information about events, campaigns and product changes. Support and helpdesk: Record solutions for problems and practical knowledge for your customer service or for customers. Search and easy navigation: Search within articles and attachments (e.g. PDF, Office documents) using a high-performance full text and title search, and a fuzzy search. 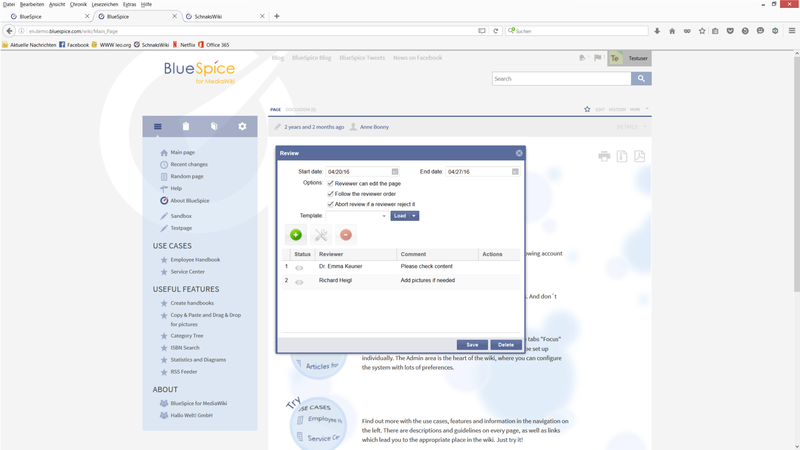 Content Structuring: BlueSpice provides a highly-flexible system to give your knowledge structure. Namespaces collect special content and user groups, templates organize articles and embed content into several places. Subpages, categories and page templates help you to manage every content. Visual Editing and rich content functions: WYSIWYG editor, working with tables and dynamic content, inserting images with copy and paste. Document Management: Categorise the documents you upload and store them with versioning. 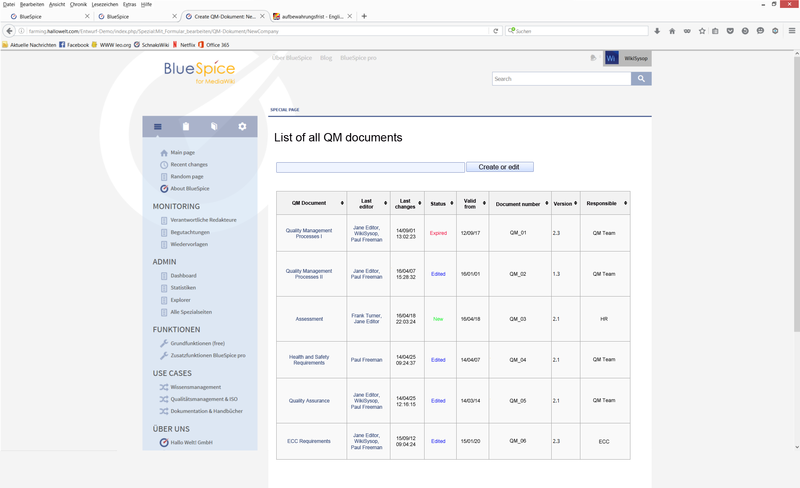 BlueSpice also lets you sort documents in a directory structure, edit optional Office documents within the wiki and limit access to documents according to content areas. Semantic Data: Semantic business wikis make it possible to enrich wiki articles with metadata and additional information and immediately query the up-to-date information. In this way, you can integrate structured data directly into the wiki. Simple forms let non-experts create and edit information with ease. Quality Assurance: You can watch articles and receive notifications when they are changed. Your colleagues can see any and all changes at a glance. On top of this, you can name responsible editors or initiate a review of article contents using workflows: The relevant colleagues edit the articles in a draft mode until the article is approved at the end of the process. Quality assurance is completed with further functions like the resubmission of articles for review and the expiry function. Bookmaker: Compile a collection of individual articles from your wiki quickly and easily, creating handbooks, documentation or instruction books with chapter navigation directly in your wiki. 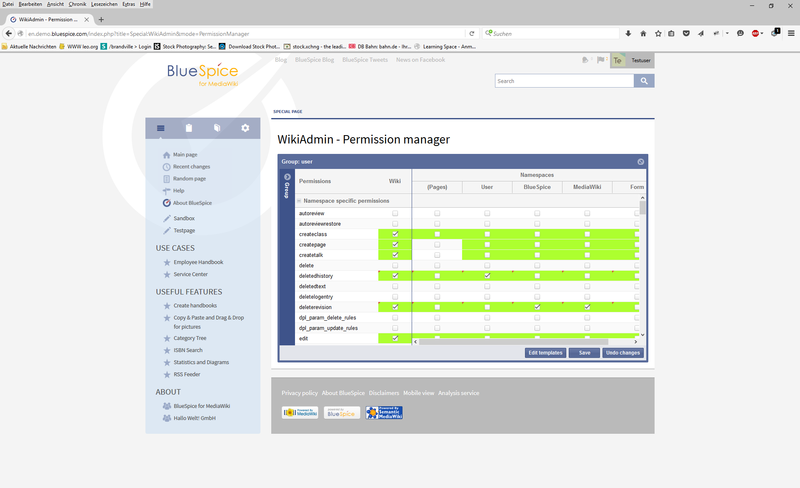 Administration: BlueSpice makes managing your wiki child's play. Set up users, namespaces, groups and permissions with a graphical interface. As an administrator, you can rename and merge accounts, copy articles or replace sections of text in all articles. Get the App for UCS! 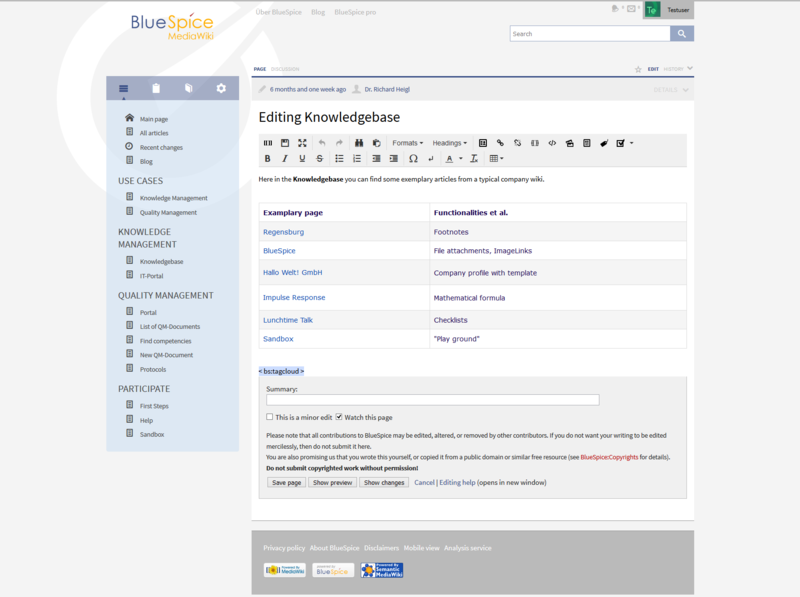 BlueSpice free provides the essential functions for running an enterprise wiki. 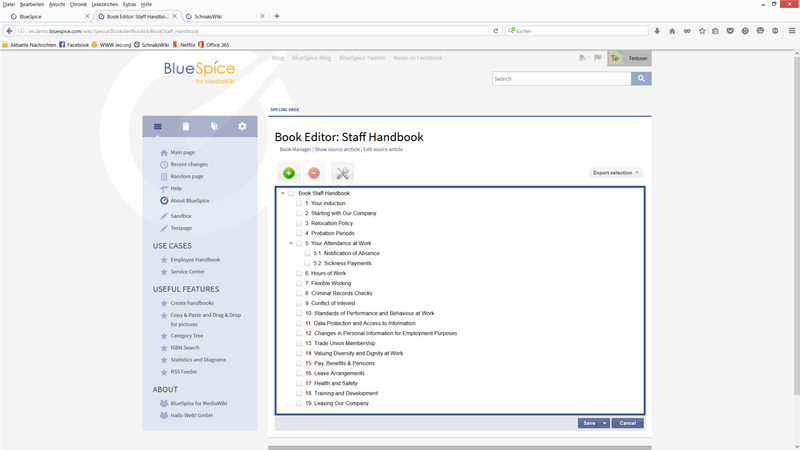 With an upgrade to BlueSpice pro you will get the full version with all the extensions for professional use in your company. The difference between the versions can be found on the comparative feature list.